London, Hammersmith Eventim Apollo Thursday 8th February and the stars came out to see Black Panther. Oscar winning leading lady Lupita 34, looked stunning in an ankle length silver/grey velvet low cut gown. The red carpet which was actually a black carpet, saw the cast Chadwick Boseman, Andy Serkis, Danai Gurira, Michael B. Jordan, Martin Freeman all there to celebrate the film ahead of the general release, alongside a host of stars which included Black-Eyed Peas, Stormzy, a beautifully turned out Leona Lewis, Rizzle Kicks, Michaela Coel, John Boyega and recently Oscar nominated Daniel Kaluuya to name a few. Black Panther as the only black superhero will bring immense excitement to Black comic fans. 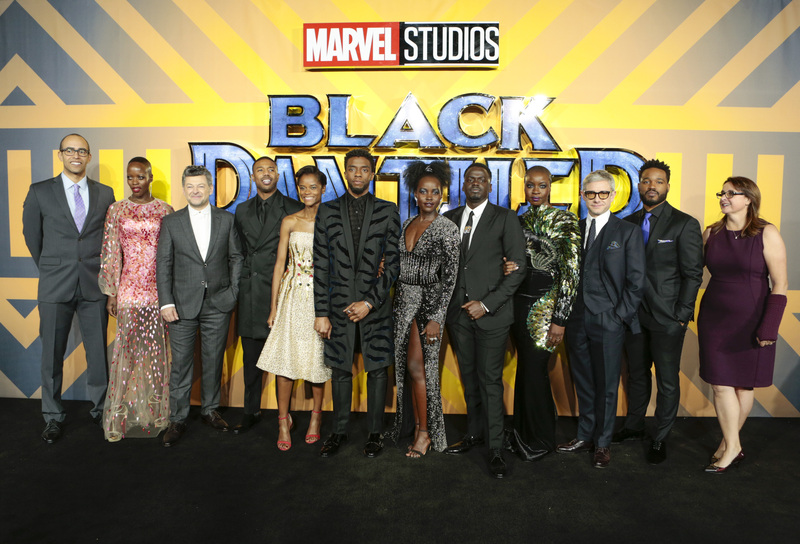 The film’s cast voiced to news teams the importance of what an predominately all Black leading cast and a Black superhero meant in terms of positive representation and the hashtag #WhatBlackPantherMeansToMe has been flooding the internet. “This is an extraordinary moment, that’s the thing it should not be extraordinary, I think we would like to see what happens. As far as black film goes every decade there is a period of time where black film makers are making films and we are all excited about it and it sort of becomes a trend, but we hope this time, there are great thing happening on TV and film “Insecure”, “A Wrinkle in Time” etc but we need 10 more years to look back and see what happens”. REVIEW: A breathtaking moment in film history Black Panther presents an entertaining politically savvy movie with a social conscious. An action packed blockbuster which takes place in the isolated, technologically advanced fictional African Kingdom of Wakanda. For Marvel fans this movie will not disappoint.